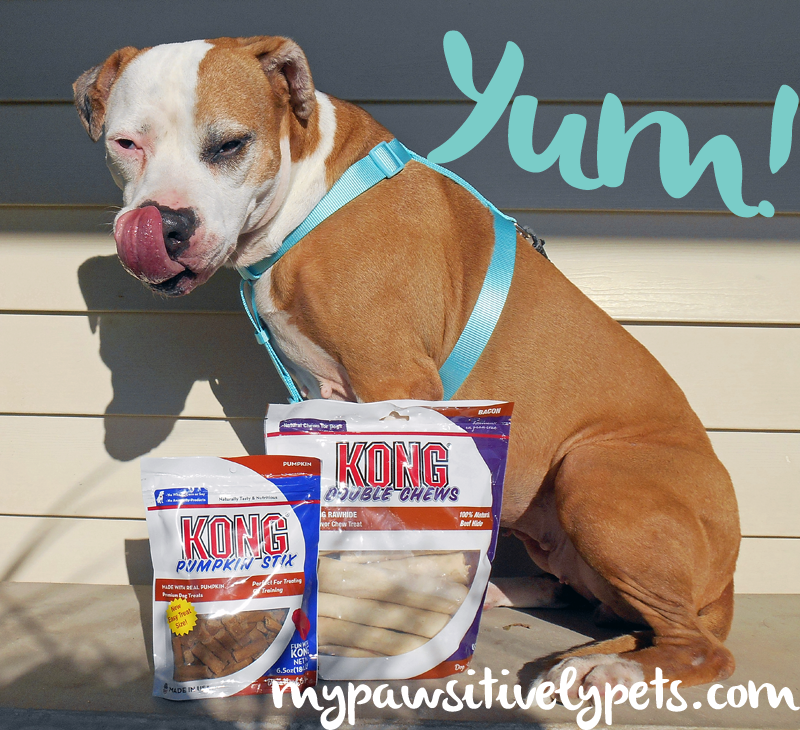 We've reviewed KONG Treats in the past, so when we were asked if we'd like to try some of their newest treats we of course said yes! JAKKS Pets has recently partnered with the KONG Company to create their USA Made, All Natural Premium Treat Line. There are several new treats and flavors to try, but Shiner thought the new KONG Pumpkin Stix and KONG Rawhide Double Chews sounded super tasty. We received a package of each of these treats free of charge for an honest review. 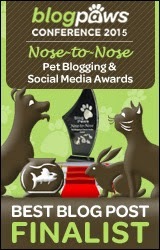 If you keep reading, you can enter to win your own tasty KONG Treats at the end of this post! First, Shiner tried the new KONG Pumpkin Stix. These treats are small and easy to break into even smaller pieces. They contain no wheat, corn, or soy and are made in the USA. They contain real pumpkin and chicken as the first two ingredients. Pumpkin contains lots of vitamins, fiber, and antioxidants. It's a great snack for dogs. But do dogs think Pumpkin Stix are tasty? Well, Shiner does! She loves her new KONG Pumpkin Stix! Can I have my KONG Pumpkin Stix now? Next, Shiner tried the KONG Double Chews. 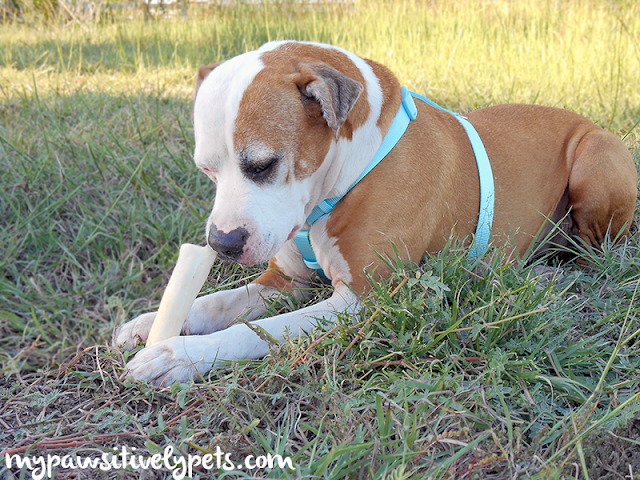 These are a long lasting rawhide with meaty flavor in the middle. They are made from 100% US natural beef hide. The rawhide is treated in Mexico. The package says long lasting, which I'm always skeptical about because Shiner can pretty much annihilate anything "chewable". These rawhides definitely live up to their name though. They lasted a very long time for Shiner and she thoroughly enjoyed chewing them. What's that in the middle of my rawhide chew? Chewing is good for dogs because it helps maintain healthy teeth and promotes good oral health. Plus, dogs just like to chew stuff anyways. Just check out Shiner in the video below chewing up her tasty KONG Double Chew. As part of our Blogiversary celebration, 3 lucky people are going to win some of their own tasty KONG Treats just like the ones featured in this post. This giveaway is open to our US readers only please. The giveaway starts now and ends on Tuesday, October 15th at 12 am CST. To enter the giveaway, please fill out the Rafflecopter form below. There are many different ways to enter the giveaway, so choose as many as you like. If you're unsure about how to enter this giveaway, please send me an email at annstaub(at)yahoo(dot)com and I will be more than happy to assist! Good luck! Disclosure: We received some KONG Treats for an honest review. All thoughts expressed here are our own. We received no other compensation for this review. 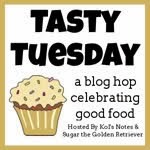 We are joining Tasty Tuesday which is hosted by Sugar the Golden Retriever and Kolchak Puggle. Visit the links below for more tasty treats! They look good for our Aunties doggies! Hey guys - she is going but does not have a date yet, let me stop by and check this out! I would be honored! Hooray! ^_^ Would you like to edit a pigture, or would you like our hooman too? Whee aren't sure if you get messages from the blog so whee will post this over there too, apologies if you are reading it twice! Love to win this. Will give it to my woofy friend, muttsy. Will give you mom's bro's addy in NY when i win. I'm sure Muttsy would really enjoy them Sushi! They look well good and glad Shiner enjoyed them. Have a terrific Tuesday. Looks like Shiner is enjoying the taste testing! I bet they are! Good luck to you Jackie. Good luck to all! 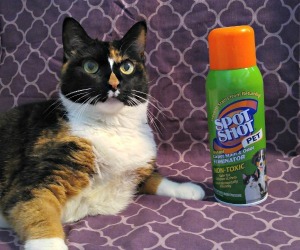 Thanks for a great review, I'm drooling now, because I watched Shiner's video! Fussy would love to try these treats as the current ones I've been giving her she now finds boring. Woot, woot! I remembered to come back a tweet again. It looks like Shiner is saying Kong Kool fur sure! Good luck Bren, I know your shelter babies would LOVE them - especially those chews. Love the video! It made me smile! Beautiful! my 2 Boys love everything Kong but we never tried the Pumpkin Stix ~ thanks for the chance :) luv the video! Good luck! They are new, and just in time for the pumpkin season! The pumpkin ones would make for yummy Halloween/Thanksgiving treats for Sookie! 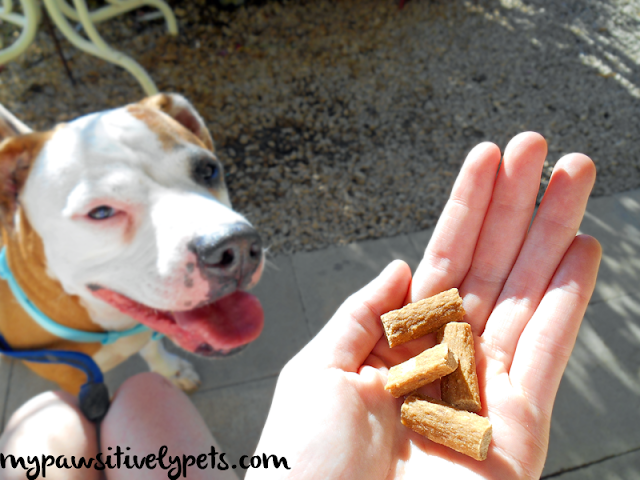 Rita is very fussy, but she loves pumpkin, so I'm pretty sure she'd love those treats! They have chicken in 'em too which makes them even tastier! I'm sure she'd like them. Those look like great treats for dogs! And pumpkin is good for everyone. Nice! How appropriate pumpkin is for this time of year! Shiner really loves those Kong treats. We do too! Enjoy and good luck to all the entrants! LOL - sorry Mollie. It's like eating candy in front of someone who doesn't have any candy I guess. Which btw I do all the time to my daughter! ;) lol... no but really I promise I'm having a nice surprise for my overseas friends on Thursday. I'm sure my Lhasa Luma would love some new treats to train with (or to convince mommy to give her when she is being especially cute). Thanks for the giveaway! Good luck to you and Luma! I have a couple of dogs that are really hard chewers. They can chew up anything in minutes. Would love to see if these last a little bit longer! Shiner is the same way Cheryl. She feels the need to inhale anything edible asap. Good luck to you! The pumpkin stix would fit in there perfectly! Good luck! I have 4 aggressive chewers who love treats of all kinds. As rescues, they deserve the best! Of course :) Nothing but the best! Good luck Mary. don't enter Dakota because he is going to be reviewing them and having a give-away quite soon himself! :) Great photos! Woohoo! Can't wait to see how he likes his. My boxers love all treats, but I think they would really enjoy treats from KONG! "I would love to win these, cause I like to eat. "-Spencer "And they all look yummy!" I'm a teething puppy & my mom is always looking for healthy, natural treats & Kong is a brand we trust. Thank you for the chance! They've tried some Kong treats before and love them! My dog has so much energy! Even at eight years of age, he still has so much energy that it is difficult for me to exercise him enough to keep him calm, relaxed and behaving properly. Sometimes just chewing on a toy or treat is a good way to distract him and let him get rid of excess energy. He would love this prize! I'm sure these would keep him busy for a little while anyways - good luck to you Heather! My puppies love anything snackwise. I am sure they will love this! My pups LOVE Kong treats!! Would love to try these. Been looking for a treat that will last and not be demolished in minutes by my rescue pittie Bleu. My puppy loves to chew and would love the KONG Double Chews. Can I ask what harness is in these pictures? I love that color! 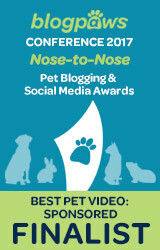 Hi Kelly, this is from Martha Stewart's pet products. It's actually a Halloween costume and came with a pair of angel wings that attach to the top. They are from PetSmart I believe.